This page lists various accessory modifications that you might find helpful. New water guns don't have tethers attaching the reservoir caps to the pressure chamber. Hasbro probably did that on purpose so these water guns lose their caps and then you have to buy a new one. 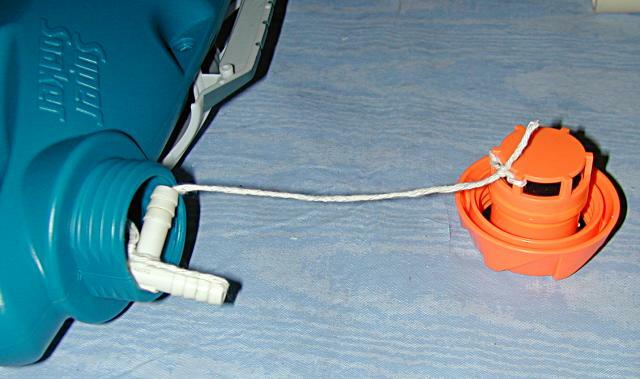 It's not too big of a problem because you can add a tether. Using a small plastic tubing tee and some string, I attached the tee to the cap. I would suggest a non-biodegradable string, like a nylon fishing line instead of a piece of normal string. Push the stopper in sideways. The result is above. Your cap is not attached. Some new water guns have very small handles, making pumping more difficult. You can replace the handle with one you build. 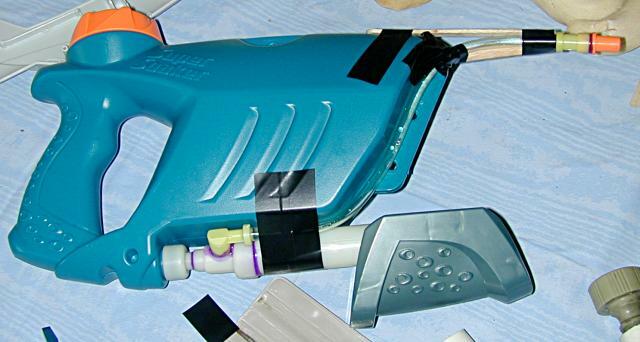 I replaced the handle on my Arctic Blast with a more traditional straight pump handle, but you can probably get more pull force with a handle perpendicular to the pump stroke (like in the CPS 1200 example below all my explanations). You also can buy grips for handles from McMaster-Carr. Search for vinyl grips. 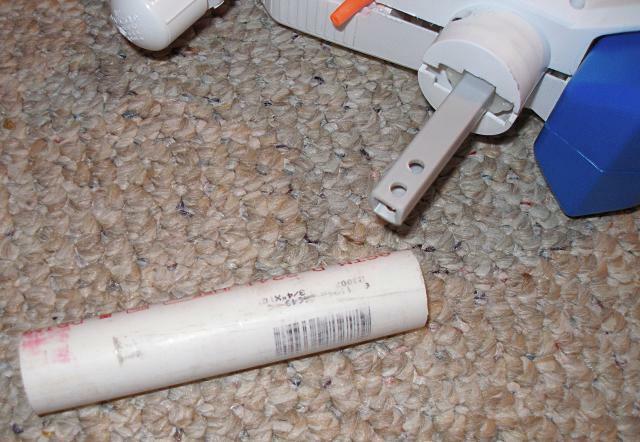 Above are the PVC pipe and the attachment point. 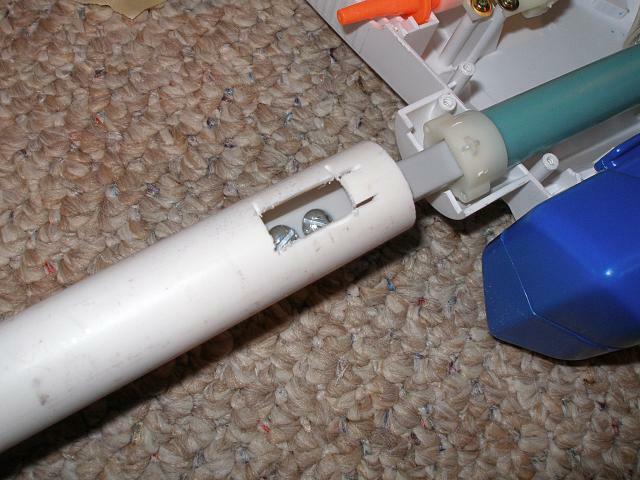 I used 3/4 inch PVC pipe and two #10-24 nuts and bolts (short bolts). 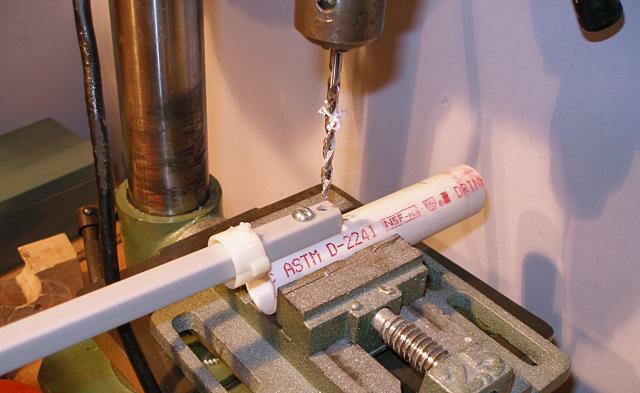 The tools I used include a dremel and drill, but you can do this with a drill and longer bolts by not using a dremel. I drilled my first hole and then put the bolt in it with the pump rod so the other hole will be aligned correctly. I then used a dremel to cut a hole so I can screw the bolts onto the nuts and pieced everything together. The finished result is above. 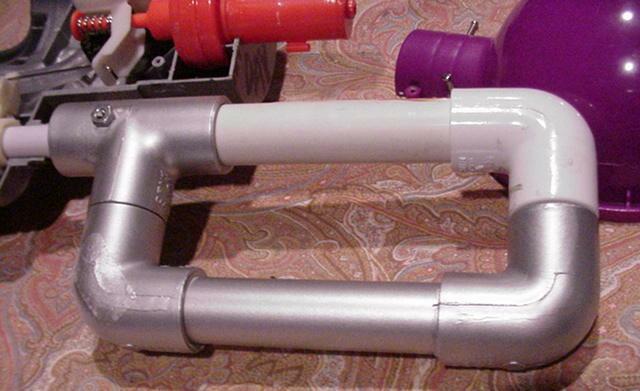 Forum member RacerSoaker used PVC pipe and couplers to make a handle that can be pulled in several different ways. 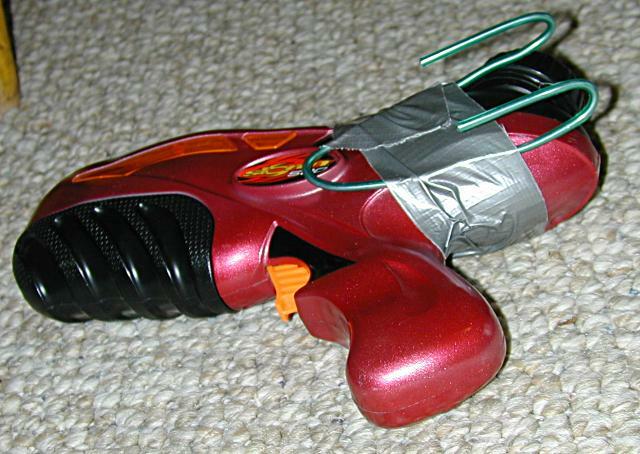 Some small pistol water guns could use some sort of belt clip. I improvised something from some thick wire I had (see image below). You can do something similar. Some craft stores sell actual clips that might work well. If you use wire, put the folded part on the outside so you clip with that rather than the pointy wire ends (backwards of what I did in the photo). 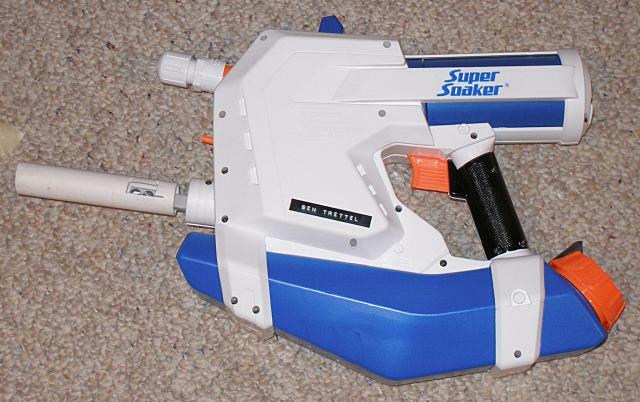 Some water guns don't have straps, but should have them. Straps can be attached. Go to a store like WalMart and look around in the outdoor section. Sometimes gun sections have straps for guns, but they can be more expensive. 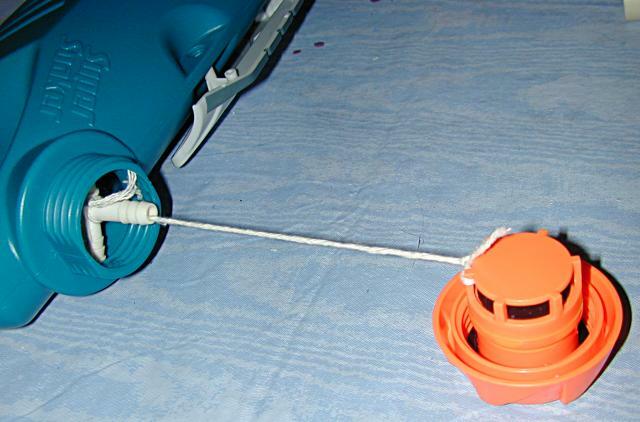 You might also want to buy some rope, duct tape, or cable ties to figure out a way to attach the strap. While I have not done it, I think the best way to attach a strap is to drill two holes in the case (with all of the internal components removed or the case by itself) and stick a cable tie through both holes, attaching to the strap. 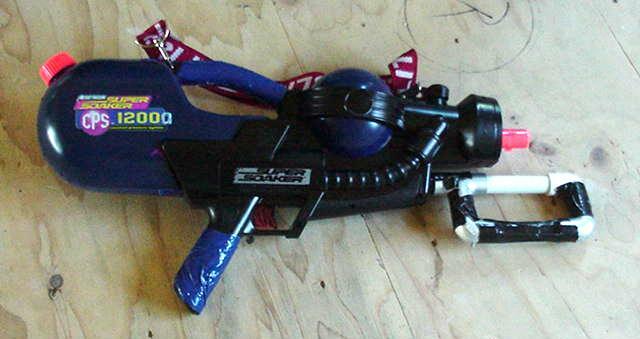 You can attach all sorts of things to water guns. Scopes and laser pointers can help with aim, though most might consider them excessive. Some sort of sight might be a good idea, however. Flashlights can help in the dark. Small water balloon launchers have also been considered. Bike grip tape can be bought at outdoor and bike stores to improve grip. It is exactly like a tape. When you buy it, open the package and start wrapping it around your grips. Some water guns have too many pieces too them. The Monster XL's bipods can be removed. The image below shows a possible minimization on a Vaporizer. I wouldn't recommend this because it's flimsy, but with some creative work with wood or plexiglass and glue, you can have something that performs exactly the same in a smaller package.